% soluble dietary fiber on a dry weight basis. Guar gum is typically milled from the endosperm of the guar bean (left picture). The final powder is a type of carbohydrate called a galactomannan. The beans are sourced from India and India continues to be a major supplier for the world's guar gum. Guar gum is used commercially primarily in food industry because it thickens in small amounts and is available for low prices. 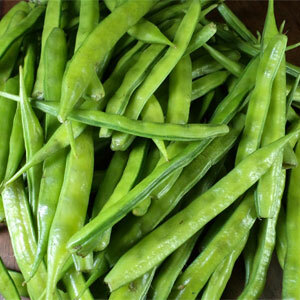 Guar gum is also known as guaran. Guar gum can be used for thickening cold and hot liquids, to make hot gels, light foams and as an emulsion stabilizer. For general thickening, you could use guar gum in place of xanthan gum or in combination with it, but xanthan gum works more quickly. But, guar gum outshines xanthan in two other ways. First, guar gum in large concentrations develops more of a sticky texture than xanthan's distinctive and undesirable "snotty" texture. Second, guar gum strongly binds water, which means that it helps to prevent syneresis (the separation of liquid water out of a sauce or emulsion). Guar gum is often used in ice creams to improve texture and in gluten-free baking to provide some of the structure that is lost when gluten is removed. Guar can be used to make dondurma, a traditional "chewy" Turkish ice cream. 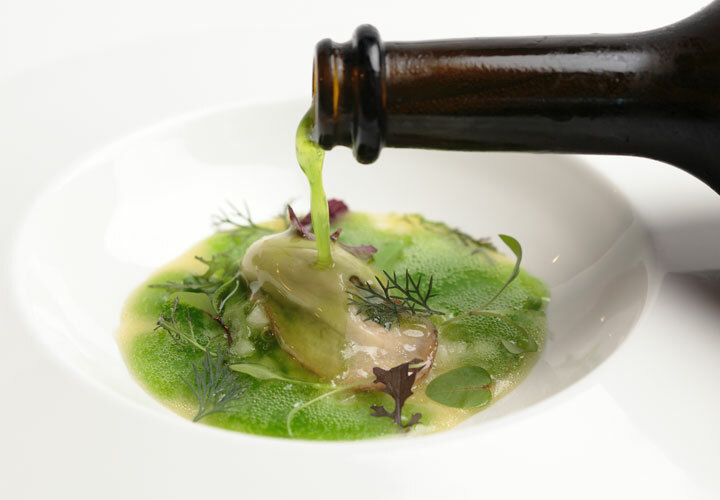 In our recipe Oyster with Parsley Champagne we use guar gum in combination with xanthan gum to make a fluid of apple juice and olive oil. Temperature: Disperses and hydrates in hot or cold water. Texture/mouthfeel: Thick sticky paste, similar to locust bean gum, a close cousin. Appearance: Opaque, not suitable for clear liquids. Flavor release: Unknown. Some users of guar gum describe it as having an undesirable "bean-y" flavor, though this flavor appears to depend on the particular brand of guar gum being used. Syneresis (weeping): Not directly relevant, since guar gum does not form a gel, but it does help prevent syneresis in other products. PH Tolerance: Viscosity decreases with lower pH, though guar will function in the 4-10 pH range. Other Tolerances: We've seen some sources say guar does not tolerate alcohol well, but we haven't tested this. Synergies with other ingredients: Has synergistic effects with locust bean gum and sodium alginate. May be synergistic with xanthan. Use together with Xanthan for thicker results (0.5% Guar Gum / 0.35% Xanthan Gum) in applications such as soups that do not require clear results. Concentration Range: For lightly thickening cold liquids that are not clear such as flavored milks, use 0.35% guar gum. Use together with Xanthan for thicker results (0.5% Guar Gum / 0.35% Xanthan Gum) in applications such as hot soups and coating sauces that do not require clear results. 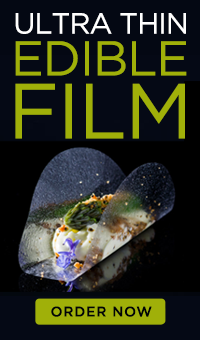 For hot gels such as a terrine that can be cut, use 0.2% Guar Gum with 0.4% Agar Agar. As an emulsion stabilizer for cold and hot applications use guar gum in the range 0.1-0.6%. To make a light foam with coarse bubbles such as a dairy-free milk shake use 0.15% guar gum with 0.25% xanthan gum. Dispersion: Like xanthan gum, guar gum disperses readily into both cold and hot water. To avoid clumps, add the gum to a small amount of cold water and form a slurry as you would with cord starch. If you are having trouble with clumps or the mixture becomes to thick, you can add some sugar or alcohol to help the guar gum disperse. Hydration: Guar gum will hydrate in cold water, but expect the viscosity to increase over the course of several hours. Hot water accelerates hydration, much like xanthan gum. Several companies make versions of fast-hydrating or pre-hydrated guar gum that will reduce hydration times.